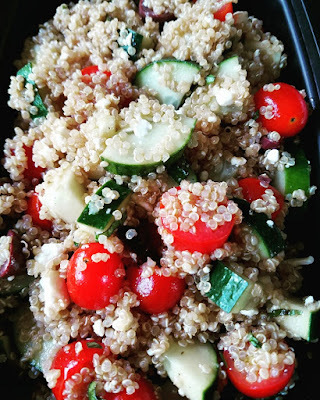 Our Friday Giveaway this week was greek inspired quinoa salad that a friend brought over for dinner a few weeks back that was simply delicious, fresh, balanced and utilizes the veggies that are coming out of everyone's gardens right now. Mix salad together. Prepare 1 cup of uncooked quinoa (yields around 2 cups cooked) and cool in the fridge. Mix quinoa and veggie salad together. Best served after an extra 30-60 minutes in the fridge and letting the flavors blend well. It's a healthy vegan and gluten free blend of veggies, plant based protein, fiber and healthy fats with a wonderfully fresh Mediterranean flavor. Enjoy!